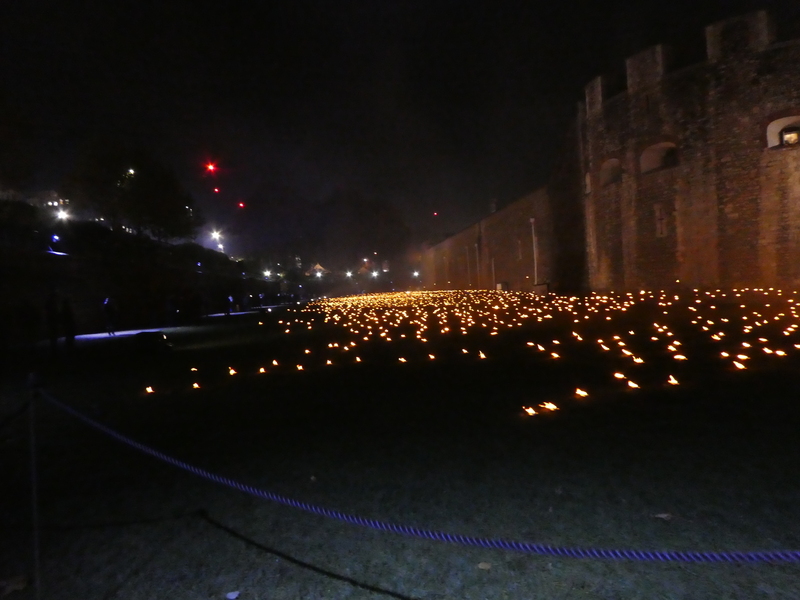 Described as “a performance,” this was the installation commissioned by Historic Royal Palaces to run for just eight nights, leading up to and including Armistice Day 2018. 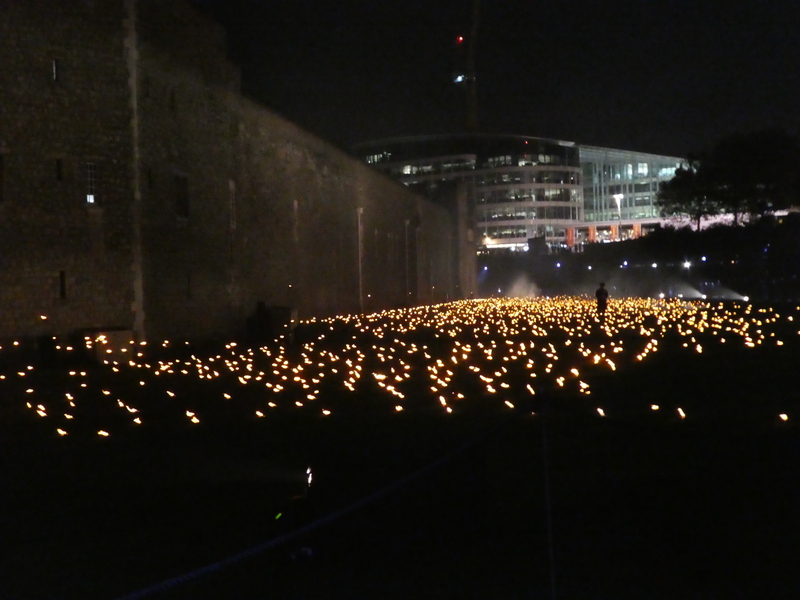 Sharing a designer in Tom Piper, whose work on the “Weeping Window” and “Arch” added so much to the poppies installed in the moat for “Blood Swept Lands and Seas of Red” in 2014, Sound Artist Mira Calix, Creative Director Deborah Shaw, Lighting Designer Phil Supple, Staging and Movement director Anna Morrissey and Flames and Mist Effect specialist Mike Jones joined the team to create something marking the end of the First World War, as impressive as the original Tower display, yet different. 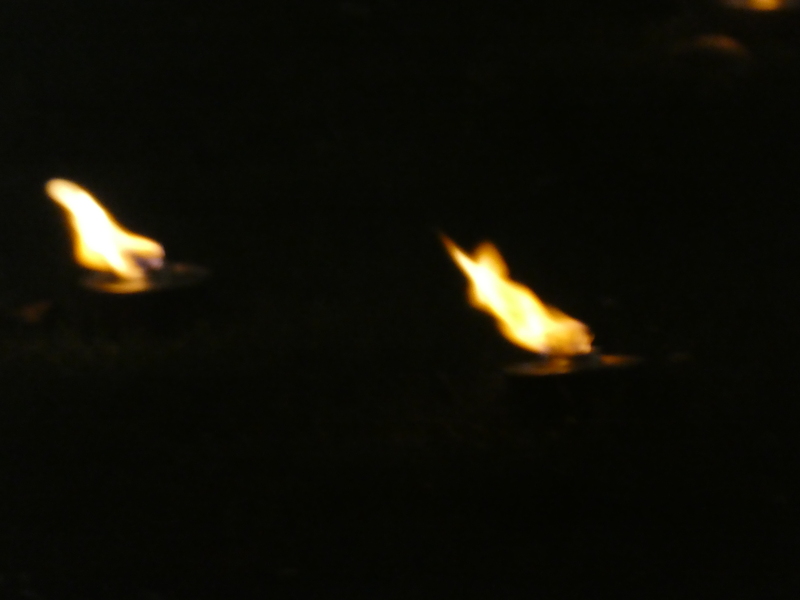 10,000 circular pots of fuel at differing heights were lit each night from 5pm, calculated for the wick to splutter out at 9pm. 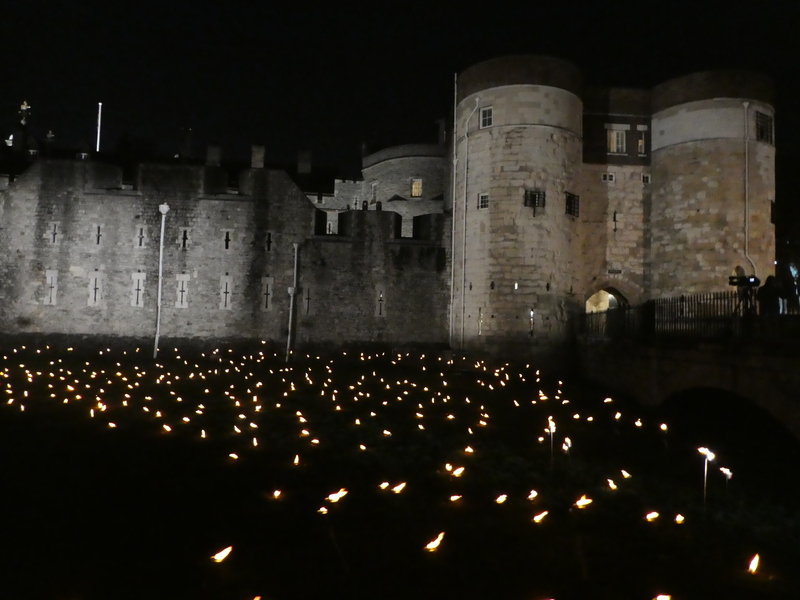 Each was placed seemingly at random throughout the moat, just as the poppies were. 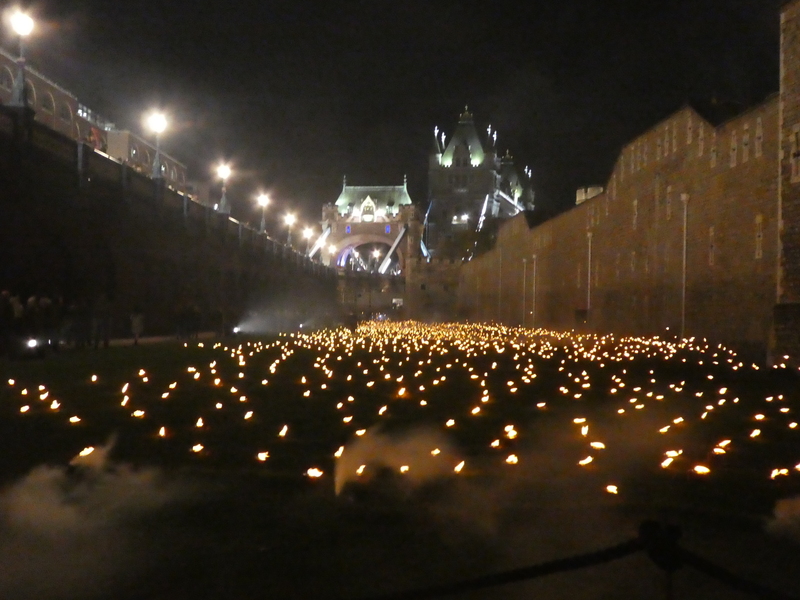 Smoke effects drifted over the field, and especially composed music played – issuing from the chest level speakers carried by mysterious grey-shrouded figures moving ceaselessly around the moat perimeter among the visitors. Yes, there were visitors. The lucky few who, like myself, responded quickly to an Historic Royal Palaces email and bought timed entry tickets for just £5 each. An unforgettable experience. Arriving on 11th November 2018, with tickets timed to enter at the exact time 100 years ago that the Treaty of Versailles was signed, I have to admit I hadn’t really known what to expect. Well, not quite true. Disappointed friends had warned of vast crowds the Friday before, so that they were unable even to reach the entrance plaza. Expecting the worst, we arrived early by a different route (walking, as advised, from Monument station to Petty Wales, avoiding the crush on Tower Hill). Vast lines were obvious, myriad nationalities patient behind crowd barriers snaking for distances that would make Disney World in high summer seem deserted. Lacking sign-posts, asking at the ticket window where “moat ticket holders” should go, I was happily directed to a sectioned off entrance through which 15 minutes before my entry-time, my party was ushered with utmost courtesy. 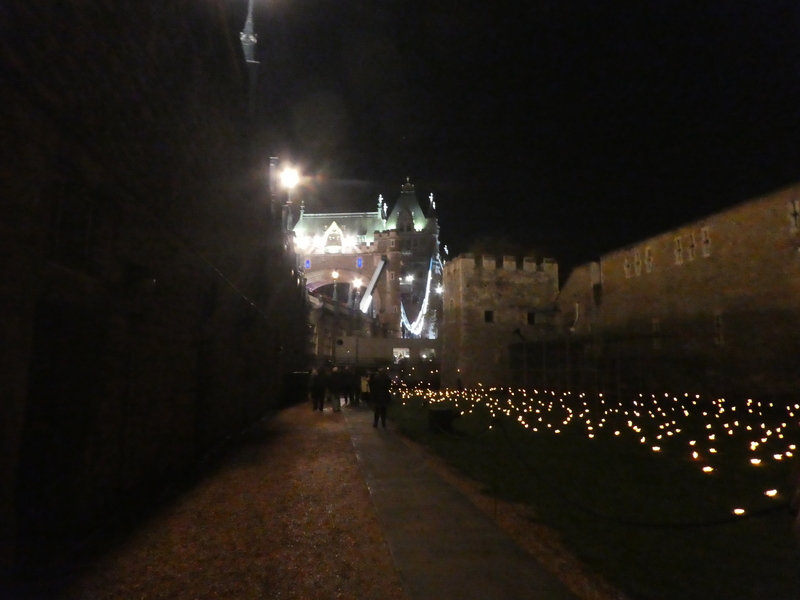 A short time in a holding-pen (watched balefully by those in the ‘public’ line – bit embarrassing), then ushered through ticket checks to a covered pavilion on the Tower Embankment. 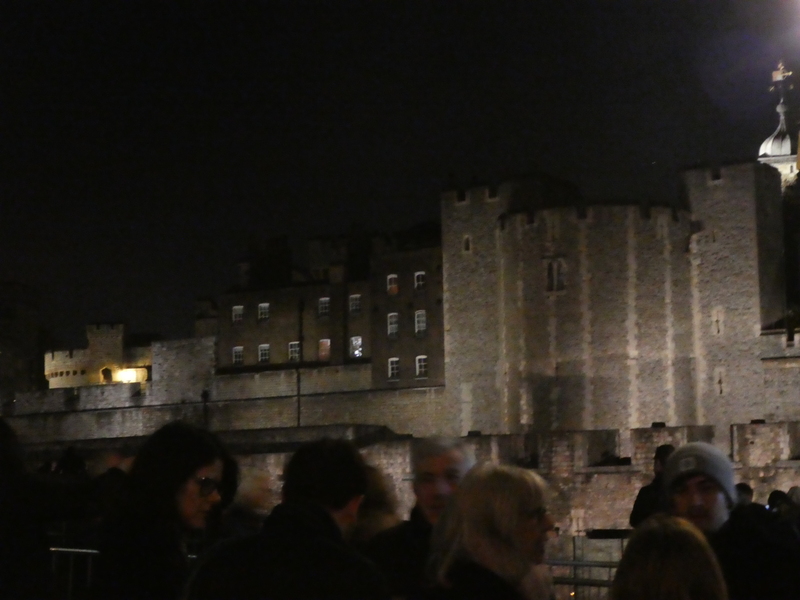 A greeting from the Master of the Tower, then a few minutes later, ushered further, through a security check and into the Tower itself – by Traitor’s Gate. A Yeoman Warder demonstrated parade-ground voice lessons (actors should learn), addressing about 200 of us effortlessly. 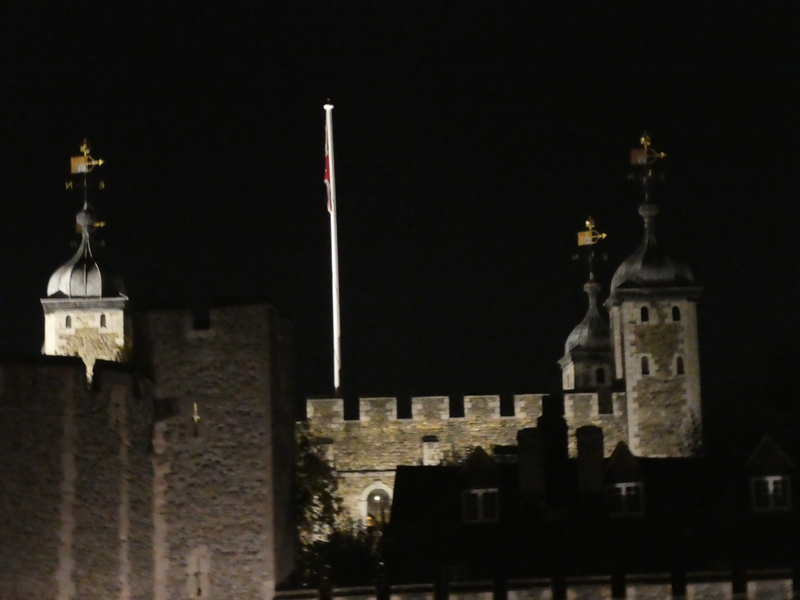 Introduction to the Tower, himself and his job, and how to behave when in the moat. The latter simply to enjoy the experience on our own terms, take pictures and video by all means but no flash photography, feel free to use the benches and don’t worry about the walking artists – they wouldn’t touch us and we don’t touch them. Gasps of wonder from all. Once used to being peered down at (thank goodness zoos today are more far-thinking), all concentration was on the images searing almost literally into our retinas, burning for sure into our souls. Many cultures and religions celebrate both life and death through kindling of flame. 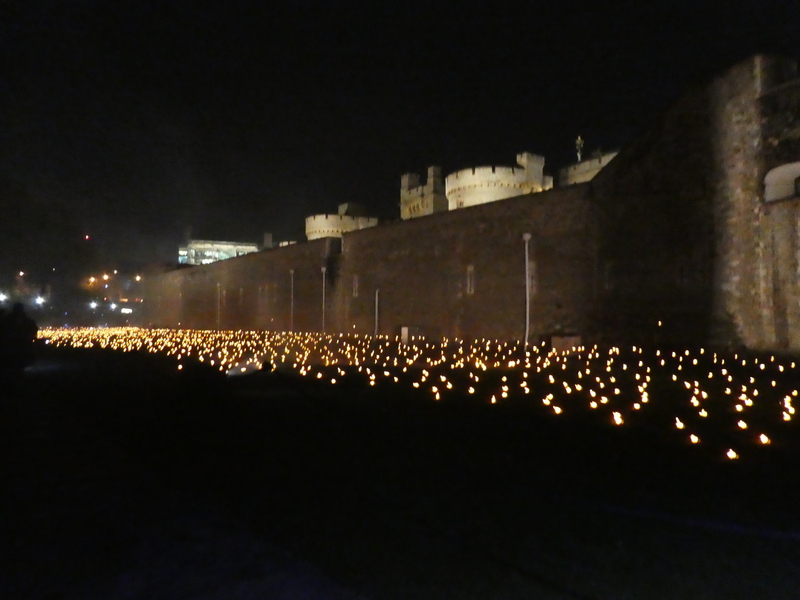 In contrast to the grief of 2014’s poppies, the lights laid in the very same place provoked hope as well as remembrance. While observing the poppies back then, I noted the feeling of seeing soldiers, then graves, then poppies and an all-encompassing humbling. This time, my over-riding reaction was hope. A lighting of the way. The grey figures were shadow-guides, the music an expression of pain for sure but also with notes of wisdom and instruction. Certainly against wreaking the same level of destruction ever again (alas, ignored short decades later) but also a reminder of what had been given and how we might proceed more fruitfully from such loss and knowledge. A slow walk, pausing for short times on the benches, the half-mile took an hour to complete. Fellow moat visitors exhibited utmost courtesy to each other, never walking into each other’s shots as photos were being taken – even sharing ideas for the best spots. Sometimes chatting and exchanging memories and thoughts, other times spread far so that for stretches we got entire sections to ourselves for private reflection. The path wove movingly for the second quarter-mile, in between part of the display. The corner hiding the “nerve centre,” the grey spirits seemingly meeting and disbanding with more frequency, the music growing more intense. time to ascend the long ramp to the exit. An elevation of some elation, just as it should be. 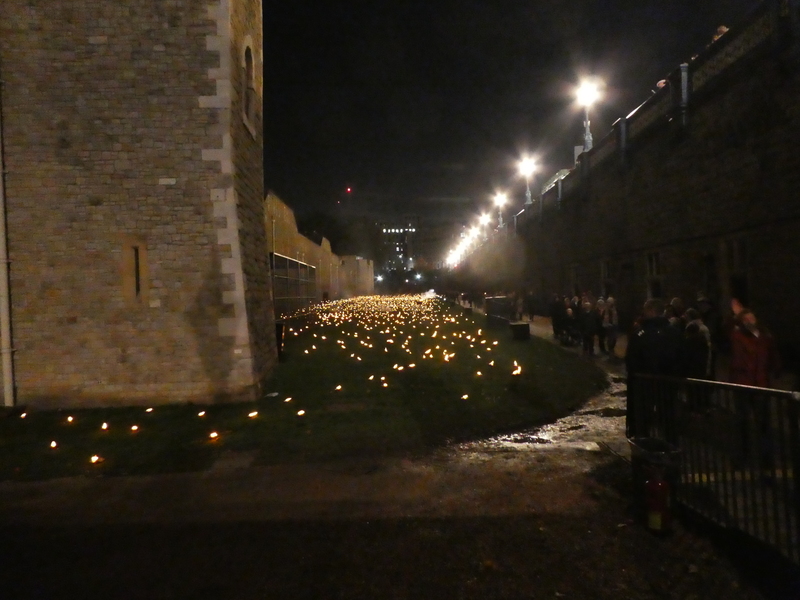 Leaving the Tower in 2014 with the heaviness of loss at what was to come, so 2018 the leaving was more one of hope. Despair at the loss, but a validation that the sacrifice could yet lead to a better future. 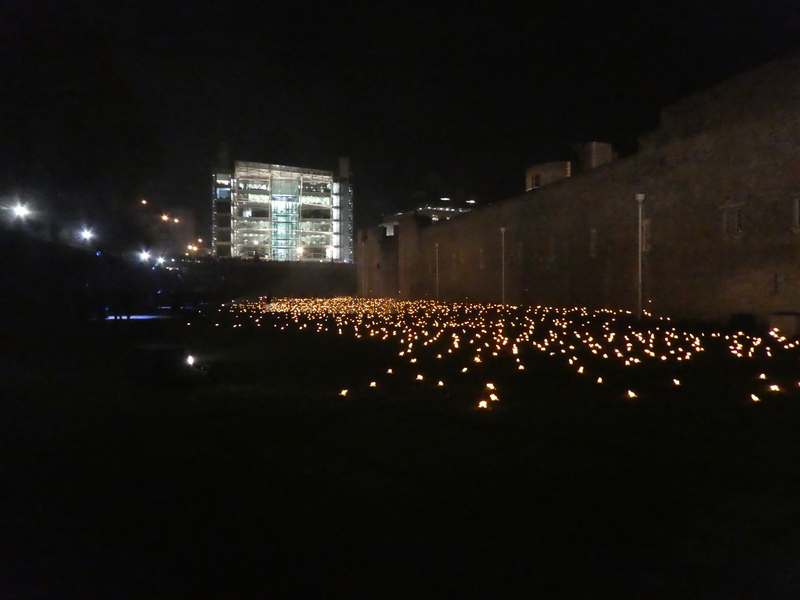 I hope that this entry is my way of honouring their desire to “Speak of Us,” and in this 100th year, my gratitude to those generations who served, and those who continue to serve for us remains as bright as those flames in Tower moat that night. Photographs copyright Theatremonkey.com. All rights reserved. Unauthorised reproduction is not permitted. ← Getting That Red Hot Ticket: Advanced Level. Thanks for sharing this. I had the other experience! 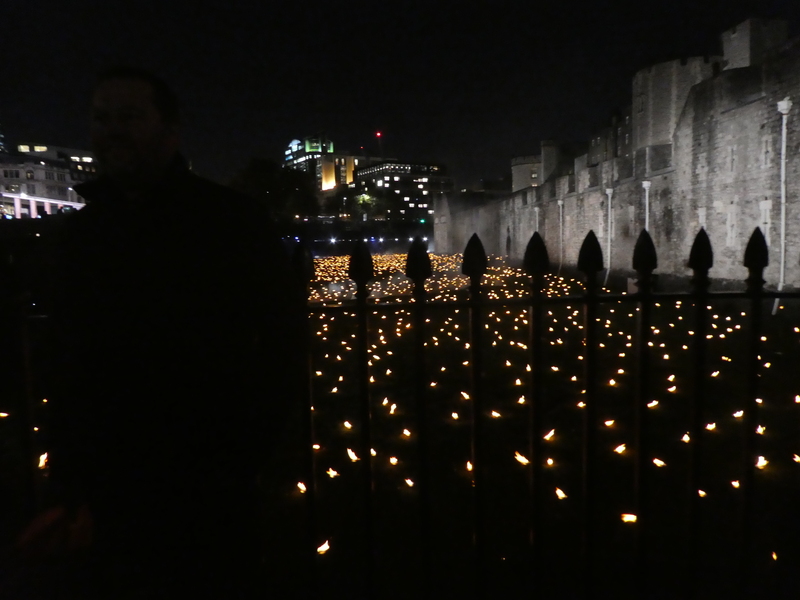 Not having had the foresight to book timed tickets, we just turned up at Tower Hill on Thursday evening and joined the throng. We took our 5-year-old Goddaughter and her mother. 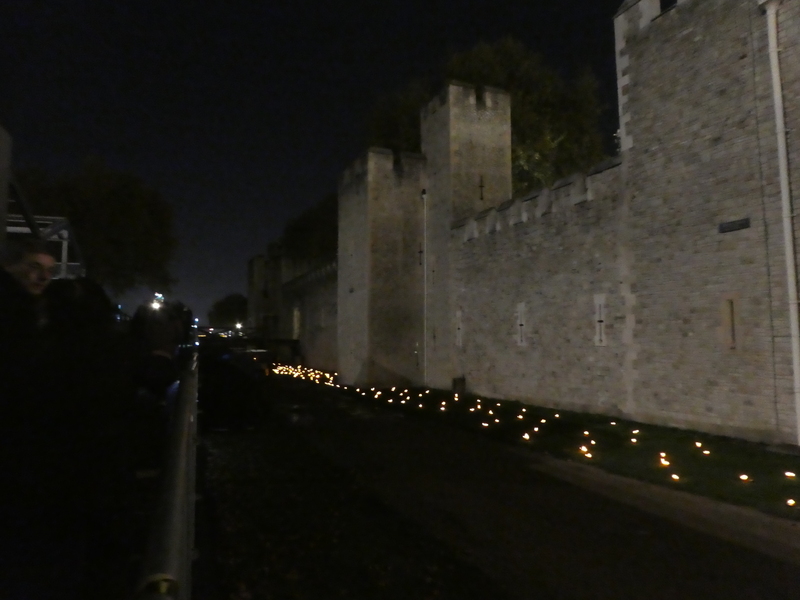 It took an hour-and-three-quarters from Tower Hill to get to the front of the Tower. But, do you know what? It was brilliant. Yes, the crowds were immense, yes the queue moved agonisingly slowly, but the atmosphere was beautiful. People talked to each other. Children were patient and (relatively) uncomplaining about the long wait. And I was moved by the fact that so many thousands of people were prepared to put themselves through this ordeal to pay their respects. There were people from all over the world in our part of the queue, all stunned by the sight of the flames, and I came away with a real sense of hope that maybe all our nations actually could live together in peace in the future. 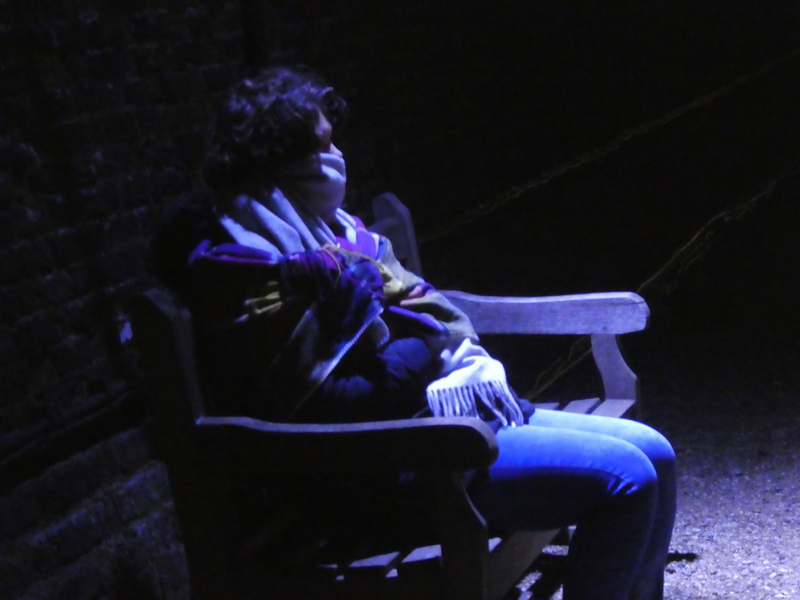 It was a privilege to be able to write it, Francesca. Oh, your account is beautiful. I can absolutely imagine the atmosphere as being like that. It sounds exactly like the “poppies” four years ago, when everybody just took turns and shared. Very pleased that it wasn’t just me who felt hopeful after the show. I was surprised to feel that, and wondered if it was odd. You have confirmed what I was feeling, so thanks for that as well. Rather wish it had been on a little longer so I could go back and view it from the walkway too, now, as well. Still, amazing memories for those of us who made it.